Ernest Ladegast 1914, 2m., 7 sp.st., 5c., tub.pn. 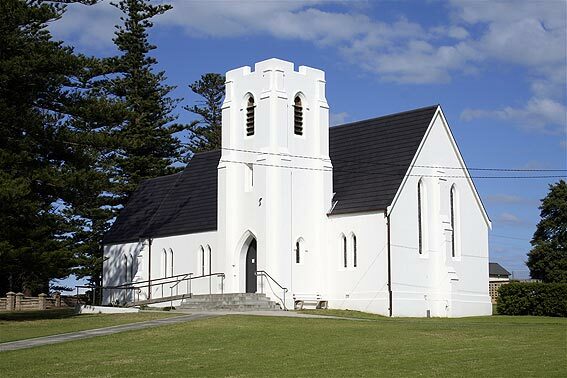 Christ Church is built on the headland of Kiama overlooking the town, beach and ocean. The organ in Christ Church, Kiama was built in 1914 by Ernest Ladegast, the son of the famous German organ builder, Johann Frederick Ladegast. He built and rebuilt several organs after he moved to Sydney, many for the British Pianoforte Depot Ltd. The Kiama organ, which was built by Ladegast himself, originally stood on the church floor but was moved to the west gallery in about 1958. The stops are controlled by rocking tablets which are colour coded for each department. The organ remains in original condition apart from the addition of an electric blower. The life work of immigrant German organbuilder Frederick Ernst Ladegast (1853-1934) is described in Graeme Rushworth’s Historic Organs of New South Wales. His father, J.F. Ladegast, was a celebrated German organbuilder, best known for the 1853 rebuild of the splendid instrument at Merseburg Cathedral, an instrument which survives today much as he left it, and one with an important link with the organ music of Liszt. In addition to working with a number of Sydney-based organbuilders after his arrival in Sydney (notably including the British Pianoforte Depot Ltd), Rushworth records that Ladegast built three organs under his own name, of which only the small two-manual organ at Christ Church Kiama survives. 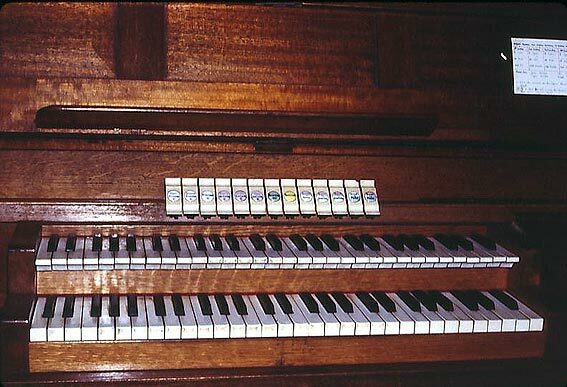 While possessing English stop nomenclature, the Kiama instrument betrays many Germanic features of its period, such as the use of cone-valve (Kegellade) chests, pipework of Germanic construction (seen for example, in the use of tuning scrolls on metal fluework) and stopkeys with multi-coloured porcelain discs. It is almost certain that many of the components of the organ were imported from Europe. 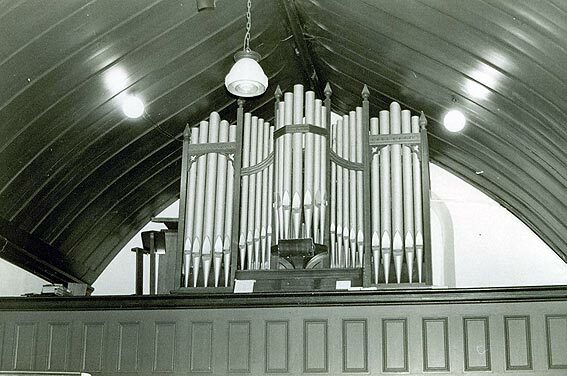 As Christ Church Kiama could not fund a restoration of the entire organ, a partial project was undertaken with three aims and this was supported by a grant of $14,000 from the Heritage Branch of the NSW Department of Planning. The first aim of the project was to repair the organ so that its functionality could be maximised, while noting that work (including the releathering of the bellows) had been done previously. The second aim was to work on the organ using authentic materials and work methods. The third aim was to repair and refinish the damaged and worn casework and to repaint the façade pipes – this work was done by Bob McKinnon of Bomaderry on a voluntary basis and was carried out independently from the church’s contract with the Jewkes firm. Mr McKinnon also repaired the pedalboard. The completion of the work has enabled the organ to sound to best advantage in the building, where it will continue to be used to accompany congregational singing, to provide additional service accompaniment, while supporting solos and small vocal and instrumental ensembles. 1. 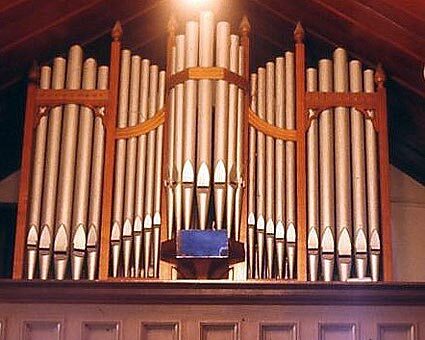 The organ was thoroughly cleaned, with all internal pipes removed, cleaned and repaired. The pipework was carefully regulated and fine tuned. After some experimentation the wind pressure was adjusted back to 3” w.g. and this has improved the speech and voicing of the pipes. (The wind pressure was measured by Stiller as 3”, or 75 mm, in 1984). The lead tubing for the manuals and couplers was repaired (or replaced with lead tube where the original was badly damaged) and reassembled with additional protective supports in places. 2. The coupler mechanism was fully restored with new leather purses and the internal diaphragm assembly was releathered. The lead tubing associated with the coupler mechanism had sagged over the years and was removed, reshaped and reassembled. 3. Note purses (almost 350) were all replaced in leather. 4. The six large stop motors were releathered. 5. The distinctive stop tablets had deteriorated, with cracks in the original celluloid (or similar early synthetic substance) plates and faded lettering on the porcelain discs. For cost reasons it was necessary for the discs to be replaced with facsimiles made in Germany and with new backing plates cast in resin in England, where the units were also reassembled. The casework and façade pipes were stripped and refinished and the pedalboard repaired. + Transposed to 4’ with new top octave 1985. The personnel involved in the project were: Murray Allan, Rodney Ford, Peter Jewkes, David Morrison, Kornelius Schmidt, Daniel Tiedman and Carmel Grech (office administrator). The organ consultant was Kelvin Hastie and the project manager was Helen Fuller (Kiama). John Stiller, “Christ Church Anglican Kiama: Documentation of Pipe Organ built by Ernest Ladegast 1914”. Organ Historical Trust of Australia and Heritage Council of NSW, 9 March 1984. Graeme Rushworth. Historic Organs of New South Wales: the instruments, their makers and players, 1791-1940 (Sydney: Hale & Iremonger, 1988), 149-51 and187. NSW Heritage: Pipe Organ Conservation and Maintenance Guide (NSW Heritage Office and Organ Historical Trust of Australia, 1998).